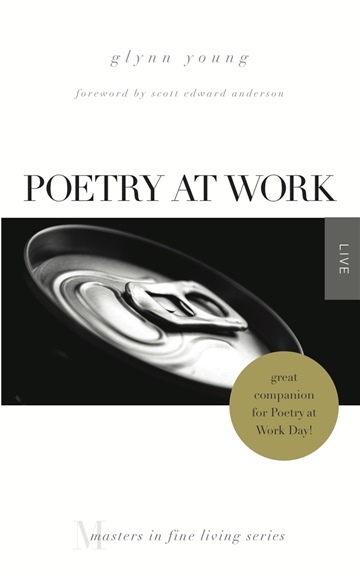 Poetry at Work is a great companion to Poetry at Work Day—an annual celebration on the 2nd Tuesday in January. In 2019, that's January 8. There is value in taking poetry to work, and finding the poetry that's already there. Publications like Harvard Business Review and FastCompany are starting to write about the power of poetry—noting poetry's effectiveness in building creative thinkers and problem solvers. Yet there is no single source to guide those who are *at work* every day, with little direction for how to explore the power of poetry in the workplace. Glynn Young's Poetry at Work is that guide. From discussions about how poetry is built into the very fabric of work, to practical suggestions on how to be a poet at work, this is a book that meets a very real need. More than just philosophy, this book brings the hope of practice and surprising discovery, the benefits of stress relief and increased accomplishment. Glynn Young leads the social media team for a Fortune 500 company. For much of his career he was a corporate speechwriter, and has won nine national speechwriting awards. He is also an editor at Tweetspeak Poetry and the author of two novels, Dancing Priest and A Light Shining. He has loved poetry since high school. I love this book in part because of its difficulty—or, rather, ease—in classifying its audience: everyone should read it. Poets, CEOs, HR directors, IT workers, nurses, job applicants, and even non-poets. Glynn Young's unique vision of poetry in the workplace goes beyond any primer or workbook—this book is elemental. By rights, Glynn Young ought to be a beaten man. After all, he’s a poet who does his day job in the prosaic world of corporate communications. But after decades of this heavy action, he remains ebullient. And now he’s out with a book on poetry, in which he describes how poetry makes companies work better, shows us ‘the poetry of vision statements’ and—even more unlikely—’the poetry of PowerPoint’ and ‘the poetry of the organization chart.’ For a corporate writer or anyone who wants to bring meaning into their work, Poetry at Work is an oasis they’ll want to call home. We don’t give ourselves enough time for poetry—at work or at home. If we did, our business life might be less stressful and more satisfying. We might find our work more rewarding. We might, as Young suggests, find the poetry at work.